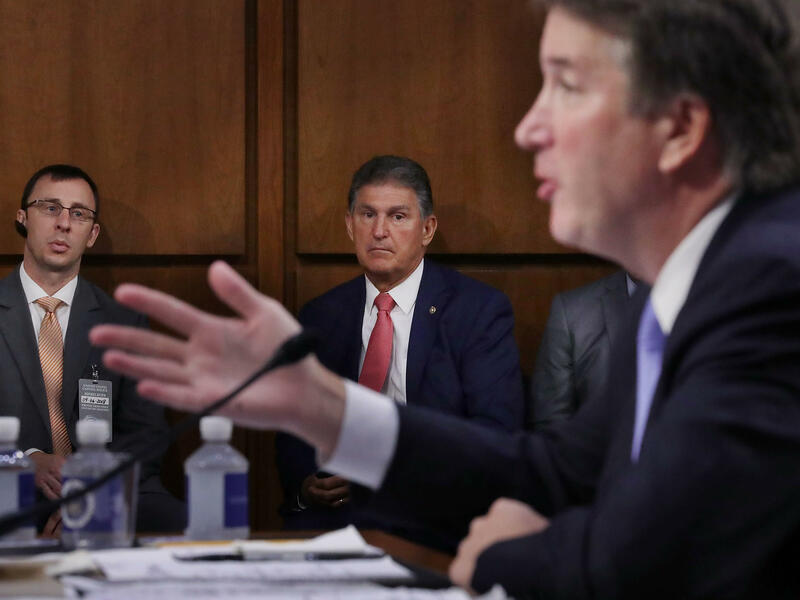 Sen. Joe Manchin, D-W.Va., listens to Supreme Court nominee Judge Brett Kavanaugh as he testifies before the Senate Judiciary Committee on Sept. 6. Running a tight re-election race in a conservative state, Manchin has faced pressure to support Kavanaugh. But with Kavanaugh now facing decades-old allegations that he sexually assaulted a woman while in high school, his once-assured confirmation has been upended and the process is being pushed back with little time — just seven weeks — before Election Day. Both Republicans and Democrats in high-profile Senate contests are calling for more investigation into the matter, with an open hearing featuring Kavanaugh and his accuser, Christine Blasey Ford, now scheduled for next Monday. However, some candidates have cast doubt on the timing and motivation of the allegations. Republicans only have a slim 51-49 advantage in the Senate. Democrats are largely playing defense this cycle, but they now have a narrow but not completely implausible path to reclaiming a majority, which would hamper the massive reshaping of the federal judiciary that President Trump has been able to execute with a GOP-controlled chamber. NPR sought out comment from every major candidate in competitive Senate contests being decided in November. In some of the tightest races there was a cautious tone. For instance, in the open Arizona Senate contests, where two women will face off — Republican Rep. Martha McSally versus Democratic Rep. Kyrsten Sinema — both said the allegations against Kavanaugh were serious and merited further investigation. McSally said that hearing testimony from both Kavanaugh and Ford was a "sensible way forward." Sinema said that judicial nominees "should be carefully vetted and judged without partisanship." Democratic incumbents in states that Trump carried are already top GOP targets and were under pressure to cross the aisle and vote for Kavanaugh. All of them said that the accusations merited further investigation. North Dakota Sen. Heidi Heitkamp underscored that it takes "courage for any woman to speak up about sexaul assault," while Missouri Sen. Claire McCaskill said she was "deeply troubled by these allegations." West Virginia Sen. Joe Manchin said that "Professor Christine Blasey Ford deserves to be heard and Judge Kavanaugh deserves a chance to clear his name." But some GOP challengers suggested that there were partisan motivations behind Ford's accusations. Rep. Kevin Cramer, who is challenging Heitkamp, said that "it is hard not to be skeptical considering the timing and history of the allegations" and that while it should be taken seriously, "absent significant evidence being brought forth immediately, I feel Judge Kavanaugh's confirmation process should proceed." Missouri Attorney General Josh Hawley, who is running against McCaskill, said in statement that while he believes both Ford and Kavanaugh should "be heard immediately and under oath," the timing of the "30-year-old allegation" was suspect. "The Democrats have played politics with this entire process and were opposed to Brett Kavanaugh before he was even nominated. They don't care about the truth," Hawley said. West Virginia Attorney General Patrick Morrisey, who is challenging Manchin, said that the "allegations should absolutely be taken seriously, but Senate Democrats have done a disservice to the accused, the accuser, and the American people, by politically waiting until the 11th hour to bring forward these allegations." In the Tennessee Senate race, GOP Rep. Marsha Blackburn, a fierce Trump defender, took one of the hardest lines. She pointed out that Senate Judiciary Committee Ranking Member Dianne Feinstein, D-Calif., has known about these allegations since this summer (although Ford only came forward publicly this weekend), and called it a "delay tactic" and that Judiciary Committee Chairman Chuck Grassley, R-Iowa, "should proceed with the vote." Her Democratic opponent, former Gov. Phil Bredesen, responded that "Ford should be heard. If U.S senators are not going to give a careful and thorough consideration of Supreme Court nominees, then I don't know what they think their job is." Both parties are already running ads about the allegations. The conservative Judicial Crisis Network announced a $1.5 million ad blitz with an ad featuring Louisa Garry, who has been friends with Kavanaugh for 35 years. "He's dedicated to his work. He's dedicated to his family. He is of the highest integrity as a person and I believe that he would be a great Supreme Court Justice," she says in a direct-to-camera ad. Meanwhile, the liberal group Demand Justice is launching a $700,000 digital and TV campaign targeting Nevada Sen. Dean Heller, who's the most endangered GOP incumbent up for re-election in 2018; Colorado Sen. Cory Gardner, the chairman of the National Republican Senatorial Committee, who is up for re-election in 2020; and moderate swing votes Maine Sen. Susan Collins and Alaska Sen. Lisa Murkowski. Below are full statements, tweets or other public comments from Senate candidates in competitive races, along with their ratings by the Cook Political Report. If a candidate has not responded to a request for comment, it is noted, and we will update if they make a statement. Republican Rep. Martha McSally: "This is a very serious allegation. Senator Grassley said he's reaching out to both parties for more information, and Judge Kavanaugh and Dr. Ford have said they are willing to provide testimony on this matter. That is a sensible way forward." Democratic Rep. Kyrsten Sinema: "The allegation is concerning and the Senate should conduct a thorough investigation before voting. Judicial nominations, especially to the highest court in the U.S., should be carefully vetted and judged without partisanship." Democratic Sen. Bill Nelson, via Twitter: "I'm still waiting for a meeting with Judge Kavanaugh I've requested four times. I have a number of questions for him. Meantime, I agree there should be an investigation of the new allegations against him. I believe the people involved should appear before the Judiciary committee." Democratic Sen. Joe Donnelly, via Twitter: "The allegations made against Judge Kavanaugh are serious and merit further review. Given the nature of these allegations, and the number of outstanding questions, I believe the Judiciary Committee should hold off on Thursday's scheduled vote. - Joe"
Republican nominee Mike Braun: "I support Senator Grassley's decision to have these 11th hour allegations thoroughly reviewed by the Senate Judiciary Committee, and weighed against Judge Kavanaugh's decades of public service, sterling record on the bench, outstanding personal reputation, and his unequivocal denial of the allegations." Democratic Sen. Debbie Stabenow, via Twitter: "This is serious. Christine Ford should be heard before the Judiciary Committee moves forward on a lifetime appointment to the U.S. Supreme Court." Democratic Sen. Tina Smith, via Twitter: "These are very serious allegations. Both Brett Kavanaugh and Christine Blasey Ford have agreed to testify in front of the Judiciary Committee and that needs to happen. And we must have a full and thorough investigation before anything else can happen with this nomination." Republican Sen. Cindy Hyde-Smith: "Having met with Judge Kavanaugh, I found him to be imminently qualified to serve on the Supreme Court, and remain confident of his confirmation. I have serious reservations regarding the questionable timing and handling of this last-minute allegation. The Democrats knew about this months ago and chose to wait until now to release it. The Judiciary Committee has scheduled a hearing on the allegation. This process should go forward so both sides can be heard." GOP challenger Chris McDaniel, via Twitter: "The same talking heads who protected Bill Clinton are the very ones destroying Brett Kavanaugh. Let that sink in." Democratic former Rep. Mike Espy: "I agree with Republicans and Democrats on the Senate Judiciary Committee that these allegations are serious and troubling. This matter must be fully investigated before the Senate moves forward with the lifetime appointment of a U.S. Supreme Court Justice." Democratic Sen. Claire McCaskill, via Twitter: "On Judge Kavanaugh: I am deeply troubled by these allegations. They should be examined thoroughly and fairly by the Judiciary Committee without any artificial timeline." Republican Attorney General Josh Hawley: "I'm concerned that Senator Feinstein and the Democrats waited until the last hour to bring this 30-year old allegation to light. The Democrats have played politics with this entire process and were opposed to Brett Kavanaugh before he was even nominated. They don't care about the truth. I believe allegations of sexual misconduct should never be disregarded. That's why it's important that both Dr. Ford and Judge Kavanaugh be heard immediately and under oath." Democratic Sen. Jon Tester: "I agree with my colleagues on both sides of the aisle that we need to get the facts about these serious allegations. I take my Constitutional duty to screen Supreme Court nominees very seriously, and I'll keep trying to get a meeting with Judge Kavanaugh to ask him tough questions about this lifetime appointment." State Auditor Matt Rosendale: Rosendale spokesman Shane Scanlon: "Matt agrees with President Trump that we should have a full process and hear from both Judge Kavanaugh and Dr. Ford. This is a serious accusation, which is why it remains deeply concerning that Dianne Feinstein and Senate Democrats sat on this information for so long and then leaked it at their convenience, right before an important vote." Democratic Rep. Jacky Rosen: "Dr. Christine Blasey Ford's account is credible, it should be taken seriously, and I agree with the bipartisan calls for an immediate and thorough investigation before the Judiciary Committee moves forward. If Senator Heller still has "no reservations" about confirming Judge Kavanaugh to a lifetime appointment on the nation's highest court, then he isn't listening to Nevadans." Democratic Sen. Robert Menendez, via Twitter: "This is exactly why we can't rush nominations. How can we vote on Kavanaugh when disturbing, credible allegations of sexual assault have been made? Even Republican Senators Jeff Flake & Bob Corker want to delay the vote. I agree. #DelayTheVote." Republican nominee Bob Hugin, via Twitter: "An allegation this serious in nature should be fully investigated. I am hopeful that Senators in both parties will ensure that happens immediately." Republican Rep. Kevin Cramer: "It is hard not to be skeptical considering the timing and history of the allegations. Of course any allegation of this nature should be taken seriously, but absent significant evidence being brought forth immediately, I feel Judge Kavanaugh's confirmation process should proceed." Democratic Sen. Sherrod Brown: "I agree with Senators on both sides of the aisle that the Judiciary Committee should take the time it needs to investigate." Democratic Sen. Bob Casey, via Twitter: "Dr. Christine Blasey Ford has bravely come forward and deserves to be heard. What she describes in her interview is a violent sexual assault, which should be disqualifying for a nominee to a lifetime appointment to the Supreme Court. The Judiciary Committee should postpone Thursday's vote and conduct a full review of this matter." Republican Rep. Lou Barletta: "We should take allegations of this nature seriously. It is unfortunate that Senate Democrats waited until the 11th hour to bring to light information they have had in their possession for months, leaving little option for giving Judge Kavanaugh and his accuser a fair hearing. Ranking Member Feinstein and her colleagues have played politics with both Judge Kavanaugh and his accuser on one of the most sensitive issues our society deals with. That is unacceptable and beneath the jobs they were elected to do. In light of the recent allegation, it would be best for Judge Kavanaugh, his accuser, and the American people to hear testimony immediately from both sides in front of the Senate Judiciary Committee." Republican Rep. Marsha Blackburn, on the Hugh Hewitt radio show Monday morning: "I have to tell you, after all the vetting that Judge Kavanaugh has been through to be a judge, a federal judge, and then the fact that this letter is something that Sen. Feinstein has had since July, I think that this is a delay tactic, and I think that Sen. Grassley should proceed with a vote." Former Democratic Gov. Phil Bredesen, via Twitter: "Dr. Christine Blasey Ford should be heard. If U.S senators are not going to give a careful and thorough consideration of Supreme Court nominees, then I don't know what they think their job is." Republican Sen. Ted Cruz: "These allegations are serious and deserve to be treated with respect. Professor Ford should have a full opportunity to tell her story before the Judiciary Committee, and Judge Kavanaugh should have a full opportunity to defend himself. That hearing should be sooner, rather than later, so the committee can make the best assessment possible of the allegations." Democratic Sen. Joe Manchin, via Twitter: "Professor Christine Blasey Ford deserves to be heard and Judge Kavanaugh deserves a chance to clear his name. Both have said they are willing to testify before the Senate Judiciary Committee and I hope they will be given the opportunity to do that as quickly as possible." Republican Attorney General Patrick Morrisey: "I have full confidence in the Senate Judiciary Committee and President Trump's team to handle these allegations in an appropriate and timely manner, allowing both sides to be heard. It is disappointing, however, that Senate Democrats held this information for weeks only to drop it on the eve of the Judiciary Committee vote. The allegations should absolutely be taken seriously, but Senate Democrats have done a disservice to the accused, the accuser, and the American people, by politically waiting until the 11th hour to bring forward these allegations." Democratic Sen. Tammy Baldwin, via Twitter: "I have read Dr. Ford's letter and I find the allegations deeply disturbing, serious and credible. There should be no vote on this lifetime nomination for our highest court until this matter is fully investigated and Dr. Ford and the nominee appear before the Senate Judiciary Cmte"
Republican nominee Leah Vukmir: "These are serious allegations and both the accuser and Judge Kavanaugh should have an opportunity to testify before the Senate Judiciary Committee. Additionally, while the Senate continues to evaluate Judge Kavanaugh, it's disappointing Senator Baldwin has been unable to do her job and meet with him."